Feel lame when it comes to limping? 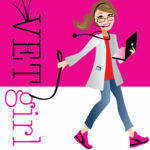 Join us for a 1.5-hour, VETgirl online veterinary CE webinar, where Dr. Michelle Trappler, DACVS, reviews the work up and diagnosis of forelimb lameness in the small animal. Emphasis will be placed on orthopedic and musculoskeletal conditions, with significant attention paid to shoulder and elbow conditions. Gait analysis, physical exam, and typical presentation of common differentials for forelimb lameness will be reviewed. Great course. Learned A LOT!!! Thanks so much! 🙂 Glad you enjoyed it!